“After the bloody battle of Ueno, eighty-three slain pro-Shogunate warriors were left uncared for on the battle-field, because they were anti-Imperialists. Priest Bukki, of the Entsu-ji Temple, with government permission, therefore buried them after cremation, and he set up a grave-stone over them. 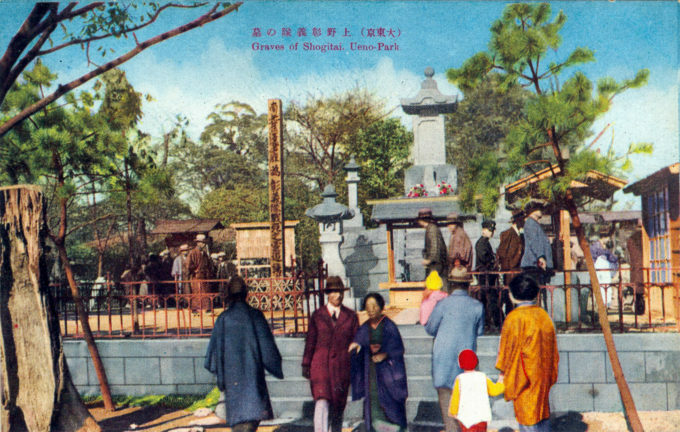 “Graves of Shogitai”, Ueno Park, Tokyo, c. 1930. From the wiki: “The Shōgitai (‘League to Demonstrate Righteousness’) was an elite corps of the shogunate, mostly made up of former Tokugawa retainers and residents of the surrounding provinces, formed in 1868 during the Bakumatsu period [baku = government, matsu = end] of civil war in Japan. “The corps took a large part in the battles of the Boshin War, especially at the Battle of Ueno on July 4, 1868, where they were nearly exterminated. Facing them were the combined forces of the Chōshū, Ōmura, Sadowara, Hizen, Chikugo, Owari, Bizen, Tsu, Inaba, and Higo domains, under the general command of Chōshū’s Ōmura Masujirō. “Shibusawa and Amano initially had the 2000-strong Shōgitai posted in Ueno to protect Tokugawa Yoshinobu, who was, at the time, in self-imposed confinement at Ueno’s Kan’ei-ji Temple. From their base, the Shogitai had been harassing Imperial troops, creating trouble in Edo, thus forcing the Imperial side, although outnumbered, to take action. “When the battle began, the forces of Satsuma, led by Saigō Takamori, attacked head-on at the gate, but were stopped by the Shogitai forces, which were superior in number. The Satsuma forces suffered heavy casualties, until Choshu forces managed to make a second attack from the rear, which unblocked the tactical stalemate. While the Shogitai put up stiff resistance, the Tosa troops also used Armstrong cannons and Snider guns to devastating effect, thus ending the last center of resistance in Edo.